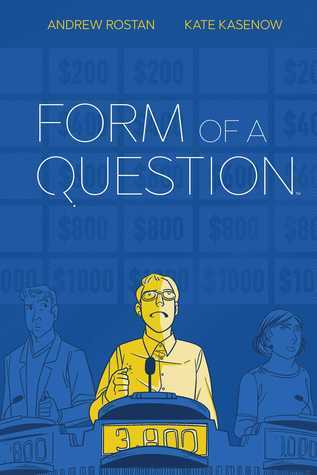 One of the graphic novel-form books I enjoyed last month was Form of a Question by Andrew J. Rostan and Kate Kasenow, a coming-of-age memoir that weaves in the author's love of the game show Jeopardy and his experiences competing on the show. The memoir opens when Andrew is a very young child, not yet in school, and yelling out the answers to Jeopardy while sitting on his grandfather's lap. It's clear that the two of them have a very close relationship...and that Andrew is an extremely smart little kid! His parents and grandparents have always encouraged Andrew's incessant curiosity and precocious intellect, so it's a bit of a shock when he starts school and is surrounded by other kids who don't appreciate his big words and constant questions. Andrew often feels like a misfit, and that feeling continues somewhat into college, though he does makes some friends and even has a girlfriend - or two. He struggles throughout college with overthinking things - what he should do with his life, which girlfriend is better for him, why he can't just relax and not worry, like so many others on campus. The story builds to its grand finale - Andrew's appearance on Jeopardy, something he has wanted since he was a small child. Jeopardy is a theme that runs throughout this unique memoir, with behind-the-scenes facts about the show, its contestants, and what it takes to win woven in throughout the narrative of Andrew's life. His growth from child to teen to adult is a relatable coming-of-age story, filled with the uncertainties and awkwardness that most of us have felt at one time or another, though Andrew makes it very personal. The illustrations help tell the story, with realistic, black and white drawings that are highlighted with splashes of primary colors. 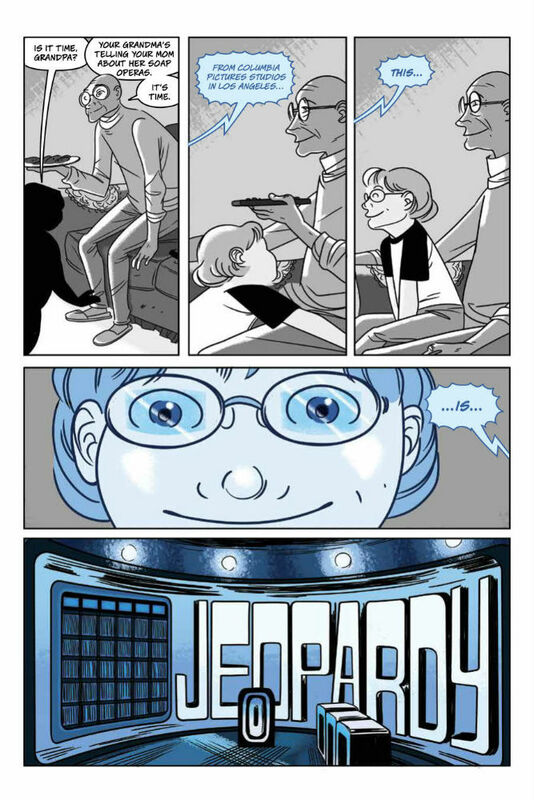 By the end of the memoir and the end of his Jeopardy appearance, Andrew has learned some important life lessons and figured some things out, with the help of his friends and his beloved grandfather, who is never far from his mind. It's an interesting and entertaining graphic memoir, and as someone who watches Jeopardy most evenings, I also found it fascinating! 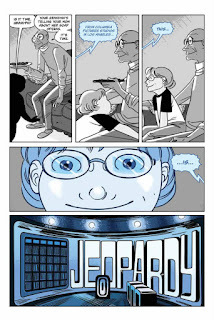 Check out a few more sample pages from the memoir here. Or you can order Form of a Question from Book Depository, with free shipping worldwide. This sounds interesting. I'll be looking for a copy! Definitely a unique story - I liked the behind-the-scenes stuff. There's something intriguing about Jeopardy!, isn't there. It sounds like a fun memoir with Jeopardy! mixed in. I haven't watched Jeopardy for years. I wonder if I'd like this one? We watch almost every night, Anne! Lots of fun, though easier in our family room than on-stage, I imagine! The book is mainly a coming-of-age story about a boy who is super smart but feels like he doesn't fit in.